Bowling Green, Ky. – More than 150 authors and illustrators will attend the 21st annual Southern Kentucky Book Fest from April 26-27, including New York Times bestselling author Angie Thomas, well known for her New York Times bestselling debut young adult novel, The Hate U Give, which was adapted into a movie in October 2018. Silas House, author of Southernmost and resident of Berea, KY, will also attend. Held at the Knicely Conference Center, SOKY Book Fest weekend is full of author presentations, panel discussions, and book signings as well as the Kentucky Writers Conference featuring writing workshops on Friday, April 26 presented by several authors who will be at the main event on Saturday. Friday also includes Teen & Children’s Day, with hundreds of school-aged children and teens attending presentations and getting books signed by favorite and newly discovered authors. Full schedules for each day, the author lineup, and workshop registration are available on sokybookfest.org. Among the expected authors in attendance are Rita Mae Brown, who has published dozens of books and successful series; Ron L. Smith, author of Black Panther: The Young Prince (Marvel Comics); Sharon Draper, middle-grade author of Blended and dozens of other titles; and Gwenda Bond, author of Suspicious Minds (a Stranger Things novel). Also in attendance are regional talents such as WKU Professors David Bell and Tony Harkins. Mark Greaney, NYT bestselling author of the Gray Man novels will sign books Saturday, as well as author Jessica Knoll, whose The Luckiest Girl Alive is soon to be a movie produced by Reese Witherspoon. Sponsored by Dollar General, Jim Johnson Nissan, WKU|PBS, The Daily News, and other local businesses, SOKY Book Fest is a partnership of Barnes and Noble Booksellers, Warren County Public Library, and WKU Libraries. 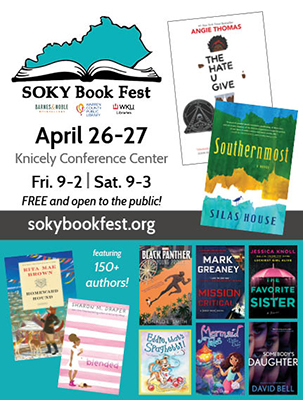 For more information, visit the website at sokybookfest.org or contact Book Fest organizer Sara Volpi at WKU Libraries at sara.volpi@wku.edu.